Executive High-Back Chair Offers Genuine Tufted Leather Overstuffed Cushions, Oversized Seat And Back, Five-Star Nylon Base With Dual-Wheel Casters And Contemporary Style Arms. Functions Include Pneumatic Seat-Height Adjustment, 360-Degree Swivel, Tilt, Tilt Tension Control And Tilt Lock. Waterfall Seat Design Reduces Leg Fatigue. Available In Black Frame Only. Chair Meets The Ca117 Fire-Retardant Standard..
Executive High-Back Chair Offers Genuine Tufted Leather Overstuffed Cushions, Oversized Seat And Back, Five-Star Nylon Base With Dual-Wheel Casters And Contemporary Style Arms. 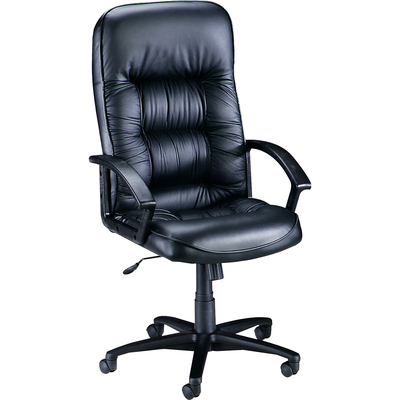 Functions Include Pneumatic Seat-Height Adjustment, 360-Degree Swivel, Tilt, Tilt Tension Control And Tilt Lock. Waterfall Seat Design Reduces Leg Fatigue. Available In Black Frame Only. Chair Meets The Ca117 Fire-Retardant Standard.